Since 2004, the Florence Poets Society has been a hub of the poetry communities in Western Massachusetts, promoting the sharing, reading, and publication of works by its members. The group has sponsored outdoor poetry festivals, poetry slams, and readings and it has encouraged publication of poetry through its annual review, The Silkworm, and through chapbooks of its members. Established in partnership with Rich Puchalsky and the Florence Poets Society, the Western New England Poetry Collection constitutes an effort to document the vibrant poetry communities in Western New England. The collection includes all forms of poetry, from the written to the spoken word, in all formats, but with a particular emphasis upon locally produced and often difficult to find chapbooks, small press books, unpublished works, and limited run periodicals. The collection is not limited to members of the Florence Poets Society, and additions from poets in Western New England are eagerly welcomed. During the summer 2004, Carl Russo and Thomas Clark gathered a group of poets in Florence, Mass., to found the Florence Poets Society. Since that time, the Society has grown in size and significance, becoming a hub of the poetry communities in Western Massachusetts, promoting the sharing, reading, and publication of works by its members. In the past several years, members of the Florence Poets Society have received grants from the Northampton Arts Council to organize an outdoor Poetry Festival in Northampton (2005-2007), and with additional assistance, they have promoted a successful, on-going Poetry Slam competition (2006- ) and a regular run of other public readings throughout the region. 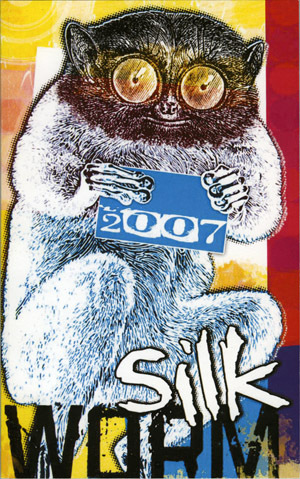 The Society publishes an annual review, The Silkworm, and since 2006 it has sponsored an annual international poetry contest that now receives dozens of submissions from as far away as Australia and the UK. The Society also supports the publication of chapbooks by its members, often working in concert with local publishers such as Slate Roof Press and Turtle Pond Press. Established in partnership with Rich Puchalsky and the Florence Poets Society, the Western New England Poetry Collection constitutes an effort to document the vibrant poetry communities in Western New England. The collection includes all forms of poetry, from the written to the spoken word, in all formats, but with a particular emphasis upon locally produced and often difficult to find chapbooks, small press books, unpublished works, and limited run periodicals. The collection is not limited to members of the Florence Poets Society, and additions from poets in Western New England are eagerly welcomed. In the collection inventory, we have included biographical statements for selected poets. And So Begin. Northampton, Mass. : Turtle Pond Press. Souls Floating By. Northampton, Mass. : Turtle Pond Press. With These Words. Northampton, Mass. : Turtle Pond Press. Old New York City Where I Lay My Head. Northampton, Mass. : s.n. Crossing the Bar. Northfield, Mass. : Slate Roof Press. Prussian Blue. Amherst, Mass. : Factory Hollow Press. The Duffel Bag. Amherst, Mass. : Factory Hollow Press. The ancient voice of God: Poetry, koans, sutras, and solsong. Shelburne Falls, Mass. : 'nlitn! publications. Chronicles of the Pig and Other Delusions. Detroit, Mich.: Lotus Press. The Dreaming Skull. Amherst, Mass. : Brutal Swan Press. The First Bird: Songs of the Dark Body in Flight. Amherst, Mass. : Brutal Swan Press. Godzillananda: His Life and Visions. Amherst, Mass. : Brutal Swan Press. Gospel of the Dark Orisha. Amherst, Mass. : Brutal Swan Press. The Luminous Heretic. Amherst, Mass. : Brutal Swan Press. The Magdalen Poems: The Love Letters of Jesus Christ and Mary Magdalene. Amherst, Mass. : Brutal Swan Press. A Winter Offering and a Second Collection. Williamsburg, Mass. : Florence Poets Society. Paradise Found: A Walking and Biking Tour of Northampton, Massachusetts Through Poetry and Art, ed. by Tom Clark, Lori Desrosiers, and Oonagh Doherty. Amherst, Mass. : Levellers Press. Beyond My View. s.l. : s.n. après bath. S.l. : s.n. first light. S.l. : s.n. A run of wet footprints. S.l. : s.n. Cook, Wanda D. and Porter, Linda, eds. flower of another country. S.l. : s.n. Apples and roses. S.l. : s.n. Back Again Bear. S.l. : s.n. 01 21 17. New Haven, CT : Dexterity Press. hitting home: poems 2004-2006. S.l. : s.n. Moonlit Pillow. Northampton, Mass. : s.n. Sensible Particulars. Florence, Mass. : s.n. Masks and Mirrors and Other Poems. S.l. : s.n. Signed by author to Vikki. More Poems in a Pinch. S.l. : s.n. Signed by author on t.p. Signed by author on ffep. Trees Are Not Still. S.l. : s.n. Outstanding Works of Genius, Vol. 2. S.l. : s.n. Moore, Maureen , ed. : Equinox: An Excursion of Stories, Poems, and Essays. Northfield, Mass. : Maureen Moore, v. 1:1. Moore, Maureen , ed. : Equinox: An Excursion of Stories, Poems, and Essays. Northfield, Mass. : Maureen Moore, v. 1:2. Moore, Maureen , ed. : Equinox: An Excursion of Stories, Poems, and Essays. Shelburne Falls, Mass. : Ginger Cat Press, v.2:1. Moore, Maureen , ed. : Equinox: An Excursion of Stories, Poems, and Essays. Shelburne Falls, Mass. : Ginger Cat Press, v.2:2. Moore, Maureen , ed. : Equinox: An Excursion of Stories, Poems, and Essays. Shelburne Falls, Mass. : Ginger Cat Press, v. 3:1. Play a Song on the Drums He Said. Brooklyn, N.Y.: Owl's Head Press. Indra's Net. S.l. : s.n. Intimate Boundaries. S.l. : s.n. Twinkle, Twinkle. S.l. : s.n. In Time for Plum Blossoms. S.l. : s.n. Buddha's Fingerprint. S.l. : s.n. The Haiku Manual of Icarus & Other Myths. S.l. : s.n. January Sun. S.l. : s.n. The Toddler's Chant. S.l. : s.n. Toy Submarine. S.l. : s.n. Gatherings: A Haiku Anthology. S.l. : s.n. Seed Packets: An Anthology of Flower Haiku. S.l. : s.n. Frogpond: A Quarterly Haiku Journal. S.l. : s.n. A robin's pillow. Northfield, Mass. : Haiku Circle. S.l. : s.n. A New York Jew in Yankee New England. S.l. : s.n. Artificial Life. S.l. : s.n. Dream House: Poems. Holyoke, Mass. : In Other Words Inc. Elusive Paths: Time and Turns of Events. s.l. : s.n. The Next Planet. s.l. : s.n. Untitled. Northfield, Mass. : Bull Thistle et al. in a folded leaf, ed. by Wanda D. Cook. S.l. : s.n. Struck Just So: A Collection of Sensual Poems. S.l. : s.n. Shorelines: Haiku, Haibun, and Tanka. S.l. : s.n. Water Poems: Haiku, Tanka, and Sijo. S.l. : s.n. The Piercing Blue of Sirius: Selected Poems 1968-2008. S.l. : s.n. "My poems have always been a way to reach that part of me and the universe that remains hidden. On one level, many of my poems are attempts to reconcile early memories of childhood, the truth of which are now greatly altered by time. On another level, poems connect me with that dark glittering Something that stands outside of human understanding, that Something coming to the forefront in lucid dreams, meditations, and when the pen writes unhindered by the mind." The Art of Awareness. S.l. : s.n. "I was initially drawn to writing poetry because it combines elements of two earlier passions in my life -- music. singing, playing the piano) and visual arts. painting, photography) -- with my love of language. And experimenting as a young adult with various crafts. including pottery and sewing) prepared me in part for the discipline and pleasures of revision. The main focus of my poems has been on nature: nature in its own right, how nature affects me personally and us as human beings. especially as a source of spiritual renewal), and how nature in turn is affected by us. I also draw on nature for metaphors in poems exploring relationships between people." Called Home. S.l. : s.n. Few Days North Days Few. S.l. : s.n. What We Find. S.l. : s.n. With Respect to Peskeomskut. S.l. : s.n. "For me, writing poetry is a way of divining what lies beneath the surface of things. If I get out of my own way, I have much to learn from the universe. I am always happy if what comes through can resonate with others." At the Nowhere Cafe. S.l. : s.n. 9/11 was 2001: a decade of political poems. S.l. : s.n. Doctor of Dead Letters. S.l. : s.n. a model of the universe. S.l. : s.n. Shards of Glass. S.l. : s.n. Sun on the Surface: Poems and Pictures for Children. S.l. : s.n. The Powers of Weevils. S.l. : s.n. Family Farm: Haiku for a Place of Moons. S.l. : s.n. Gathering Peace. S.l. : s.n. The Trees Bleed Sweetness. S.l. : s.n. Before and After. S.l. : s.n. The September Poems. S.l. : s.n. Set on Freedom, vol. 1: Disability Poems. Mariposa Press: Belchertown, Mass. Set on Freedom, vol. 2: Feminist Poems. Mariposa Press: Belchertown, Mass. Set on Freedom, vol. 3: Queer Poems. Mariposa Press: Belchertown, Mass. Set on Freedom, vol. 4: Person of Faith Poems. Mariposa Press: Belchertown, Mass. Set on Freedom, vol. 5: People of Color Poems. Mariposa Press: Belchertown, Mass. Set on Freedom, vol. 6: American Poems. Mariposa Press: Belchertown, Mass. Words Inspired by the People's Music Network. S.l. : s.n. Home Grown. Middletown, Del. : s.n. Richardson's Milk: Poetry from the Crate. Florence, Mass. : Florence Poets Society Press 38p. Trues Lies of Love. S.l. : s.n. Love Illusions. S.l. : Lonegoddess Publ. Peggy's Poems. Leeds, Mass. : s.n. Acquired by gift from Rich Puchalsky and assorted friends and associates of the Florence Poets Society, 2008-2014. Processed by I. Eliot Wentworth, 2007-2014. Cite as: Western New England Poetry Collection (MS 561). Special Collections and University Archives, University of Massachusetts Amherst Libraries.